Change Data Capture (CDC), as its name suggests, is a design pattern that captures individual data changes instead of dealing with the entire data. Instead of dumping your entire database, using CDC, you would capture just the data changes made to the master database and apply them to the BI databases to keep both of your databases in sync. Debezium is a CDC tool that can stream changes from Microsoft SQL Server, MySQL, MongoDB, Oracle and PostgreSQL into Kafka, using Kafka Connect. Kafka Connect is a tool for streaming data between Apache Kafka and external systems. It is used to define connectors that move large collections of data into and out of Kafka. Etlworks Integrator parses the CDC events emitted to the Kafka topic, automatically transforms events to the DML SQL statements (INSERT/UPDATE/DELETE), and executes SQL statements in the target database in the order they were created. It also handles the collisions and errors, ensuring that the solution is 100% reliable. The solution requires installing and configuring Apache Kafka, Kafka Connect, and Debezium. Installing and configuring Kafka and Kafka connect (Kafka component required for CDC) is not part of this tutorial. In most cases installing Kafka is as easy as downloading the latest version of the standalone or dockerized Kafka and Zookeeper. Kafka Connect is typically included in all distribution packages so there is nothing to install. Debezium can be installed as a plugin for Kafka Connect by simply copying required libraries to the KAFKA_HOME/plugin folder. For customers on Enterprise plans, Etlworks installs all required components. We provide assistance with installing components to the self-hosted customers. Please contact Etlworks support if you want to enable a real-time change replication for your account. The CDC events are serialized as JSON or Avro documents and can be transformed using any of the available in Etlworks transformations. Setup CDC for the source database. Configure Debezium to capture CDC events and publish them to the Kafka topic(s). Create a change replication flow where the source is a Kafka topic and the destination is a target database table. Assuming that the Debezium is already installed as a Kafka Connect plugin and up and running, we will be configuring a connector to the source database using Kafka Connect REST API. In this tutorial, we will be using Microsoft SQL Server, but configuring connectors to other databases is equally simple. The Debezium connectors are created using Kafka Connect REST API so make sure either curl or Postman is installed in your development box. In this tutorial, we will be using Postman. Step 1. Verify that Kafka Connect is installed and running. Step 2. Create a new connector for Microsoft SQL Server. the CDC events for the table cdc_test will be stored in a Kafka topic database_server_name.database_name.cdc_test. Etlworks automatically parses CDC events stored in a Kafka topic so you don’t have to deal with this, but it is still a good idea to learn how exactly the generated events look like for the different DML statements. Step 1. Create source Kafka connection. When creating connection select Debezium as CDC provider. Enter a wildcard topic name in the format database_server_name.database_name.*. Step 2. Create a JSON format with all default settings. Step 3. Create a connection to the destination database. Disable the auto-commit. Step 4. 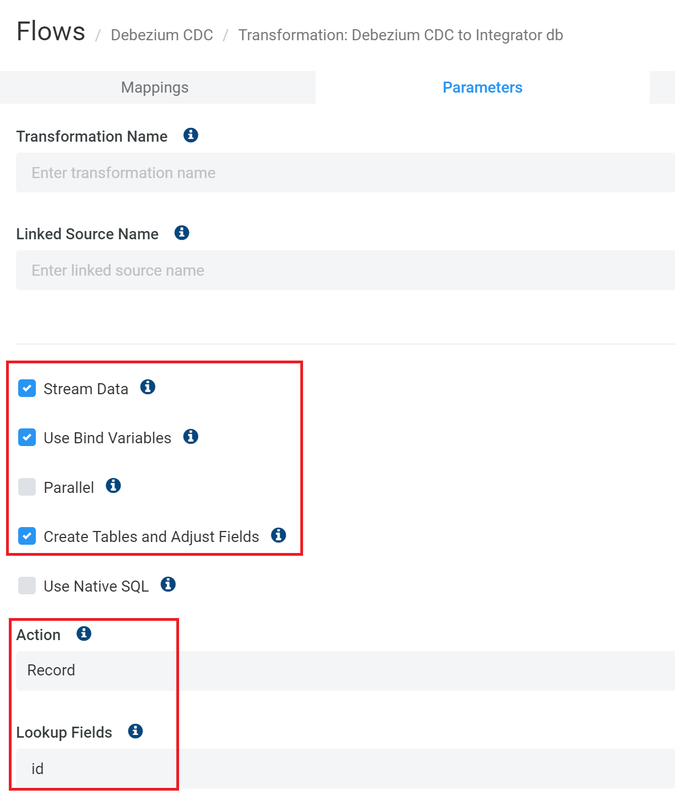 Create a new flow by selecting Stream data from queue to database from the gallery. the FROM connection is the connection to Kafka created in step 1.
the FROM format is the JSON format created in step 2.
the FROM is a topic name for the specific table. the TO is a destination table name. the TO connection is the destination database connection created in step 3. Lookup Fields – the unique field(s) for the record. In our example the unique field is ID. Step 7. If the foreign constraints are disabled (or do not exist) in the destination database, you can enable processing of each transformation in a parallel thread. Step 8. 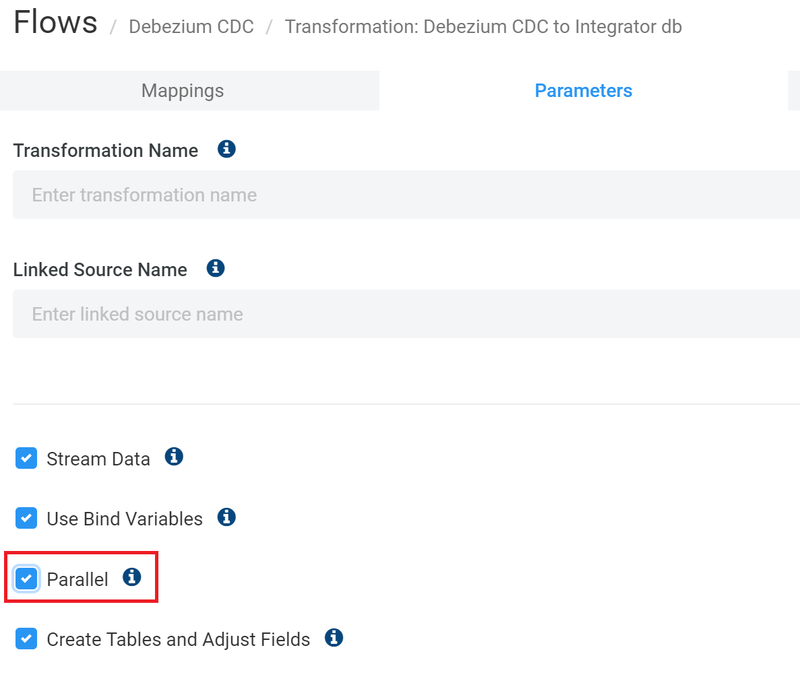 Add the source-to-destination transformations for all tables with enabled CDC. You can duplicate the existing transformation and change the topic name (the format is server_name.database_name.table_name), the destination table name, and the lookup field(s). Schedule the flow to be executed in real-time.